It was a great surprise to me this morning when, reaching for the offering envelopes as I headed out to church with my girls, I noticed that five weeks of offering envelopes were still sitting in the box. I have failed to make our weekly offering since the beginning of this penitential, sacrificial season of Lent. How’s that for a Lenten sacrifice – giving up giving! With the Reverend Wife running around on Sunday mornings tending to the worship and pastoral life of our congregation, our family’s offering is my responsibility. But when I look back on my calendar, I see that over the first five Sundays in Lent I have been chaplain at a youth event, preached in a neighboring church, worked in the hospital , been away visiting my mom, and . 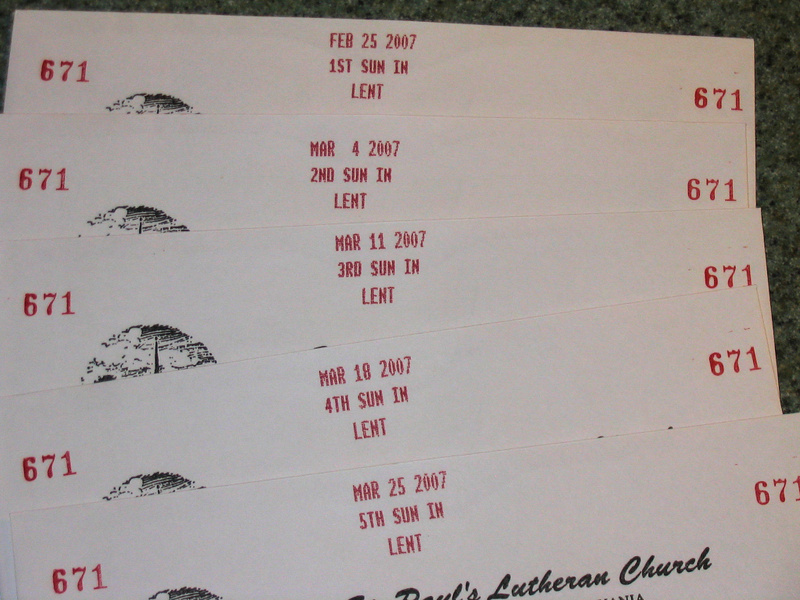 . . well, the other Sunday I simply must have forgotten my offering envelope. Our checking account will take a big hit this week, as we make up for five weeks of gifts to the church. And after looking at our taxes, we are wondering if we should increase our giving, anyway. To our surprise, we gave away only 6.6% of our income in charitable gifts last year (almost entirely to the seminary or to our church). For several years we’ve had a goal of reaching a 10% giving level, so 6.6% is disappointing. I think that we give about 8% or so of our regular salary, but over the past year we’ve received a significant amount of income in stipends and honoraria – and generally we put these directly into savings. Tithing this extra income – and sometimes giving the entire stipend to the church – would help us get toward our 10% while also furthering the work of the church. All that we have comes from God – this money is not "ours." As we write a few more checks this week, I give thanks for the ways in which we are blessed and for the opportunity to direct some of God’s gifts for the use of the church and the benefit of those less fortunate.